Globetrotting fare and copious cocktails define the scene at this elegant hotel lounge. Open Sun.-Thurs. 4 p.m.-12:30 a.m., Fri.-Sat. 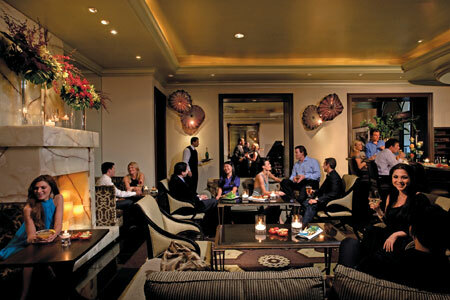 4 p.m.-1:30 a.m.
: The lounge at the Four Seasons Hotel Los Angeles at Beverly Hills is a true classic, always packed with a stylish clientele. The interior has a green onyx fireplace as its masterpiece, along with wood wine cabinets. 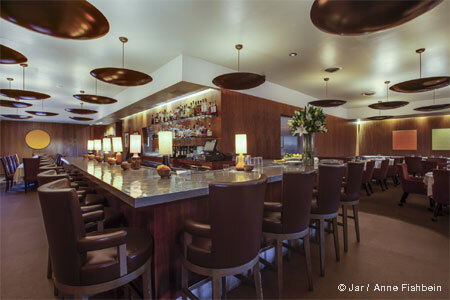 Of course, the drinks are a large part of the ambience, and there’s live music Friday and Saturday. The cocktail list is lengthy, but the innovative menu is definitely not an afterthought. Nibble on mushroom croquettes, adobo chicken tacos or crispy heirloom cauliflower. The "classic" section of the menu includes the signature burger, king crab tacos and the "Young Hollywood" salad with black kale, goji, pomegranate, berries, pistachio, pumpkin seeds and bee pollen. More fun is in store with sweets like churros with a Mexican chocolate sauce. Windows Lounge is the only public place in North America serving Rémy Martin’s Louis XIII Rare Cask 42.6 Cognac ($1,000 per half ounce).